Hey everyone, this is the official sign-up thread for CPL Season 4! For those of you who don't know, the Coach Pupil League is a StarCraft community designed to help lower to mid level players improve in a competitive team league format. Every season groups of players team up under the tutelage of experienced coaches and compete against each other over several weeks before entering into the playoffs, and eventually a finals! If you'd like more information you can always check out our Liqupedia pages or view games from previous seasons on the CPL YouTube Channel. With no minimum requirement to join, the CPL is a great place to learn the game and get your start at StarCraft. If you already have some BroodWar experience but not sure how to improve next, it's the perfect place to take your game to the next level! While teamliquid will be used for some things, it's recommeneded you also join the CPL Discord as a lot of the communication for the league will be done there. 1. The opportunity to play up to one match a week vs an opponent of similar skill. 2. You do not have to participate every week. 3. You do not have to play at a specific time, but arranging to pre-play matches is up to you and your opponent. 4. Higher level players are expected to spend time assisting their team mates. 5. There are no minimum time requirements for participating, but the more you put into the CPL the more you get out of it! 1. To spend some time to prepare your team members for their weekly matches. 2. All teams will have more than one coach to help with the time commitment. 3. Full autonomy in how they want to coach their players. 7. (optional) Any additional info such as if you have a couple players you'd like to play with or a certain team**. **Please note that we can't guarantee anything as there are a number of factors that go into team creation. Once again I'd like to remind everyone there is no minimum requirement to sign up, and this is a great place to learn, even if you've never played a game of BroodWar. Last season we had a soft cutoff of around 1900MMR for players, this will be subject to change this season depending partially on sign-ups. I look forward to seeing you around the league this season! Sign-ups for CPL will be open for at least 2 weeks! 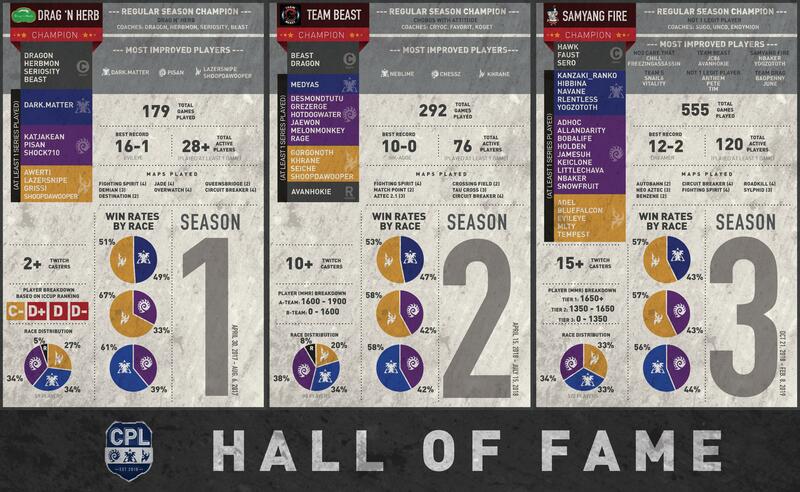 While we're waiting to get things going we've put together a graphic showcasing some of the different stats and information from previous seasons for everyone to see. I want to give a shout out to littlechava for the original idea of creating something like this for the league, and to SuperCyan who has worked with me over the past couple of months to put this together! We would also like to get an idea on a couple of things before we get the league going. How would you like teams to be formed? Both options will be somewhat based on player mmr and tiers to balance teams as much as possible. Poll: How do you want teams to be picked in season 4? We have a weekly deadline for all matches to be played, with the option to organize an earlier time with your opponent to pre-play matches. Last season this deadline was Sunday 15:00 EDT. Would you prefer this deadline to change? Poll: What time do you want the game deadline? We will be beginning preseason shortly. Check the CPL Discord for updates. 7. I would like to play with everyone! 7. If there's a lmaster team, I mod that discord so I would like to be on that. - Also having Cadenzie as a coach would be nice! Was eGG_ last season but this should make it easier for everyone. 4. 1650 right now, I fluctuate in the 1500-1700 range. 7. I heard the Lmaster Beginner Starcraft discord might have a team, in that case I wanna be in that! that's my BW home.